When you'e visiting a new church, you'll have some questions. What will our first visit be like? Will we know where to go? How long will the service last? Not to worry, we have you covered with some quick tips for your first visit. You'll be greeted when you arrive by our friendly volunteers. You can stop and learn more about ElmCreek Community or go directly to our worship service. Our volunteers will help guide you to our children's classes and worship center, taking the pressure off finding your way on your own. Our children's classes occur during our worship service and are a great place for your kids to learn about Jesus while making friends. Our volunteer teachers are trained and background checked for peace of mind while you worship. Once in the worship service, make yourself at home. You can expect a 75 minute worship service with contemporary music and a message from the Bible that applies to your everyday life. Once the service is over, we invite you to stick around. We'd love to get to know you and answer any questions. ElmCreek Community Church was started by a small band of people with a vision for a caring community in Maple Grove and Osseo area. ElmCreek desires to be a safe place for people of all walks of life to learn and grow to be like Jesus together. Our goal is to represent Jesus and live out what our logo represents. Each of the 10 rings of our logo is a unique size and is not complete. 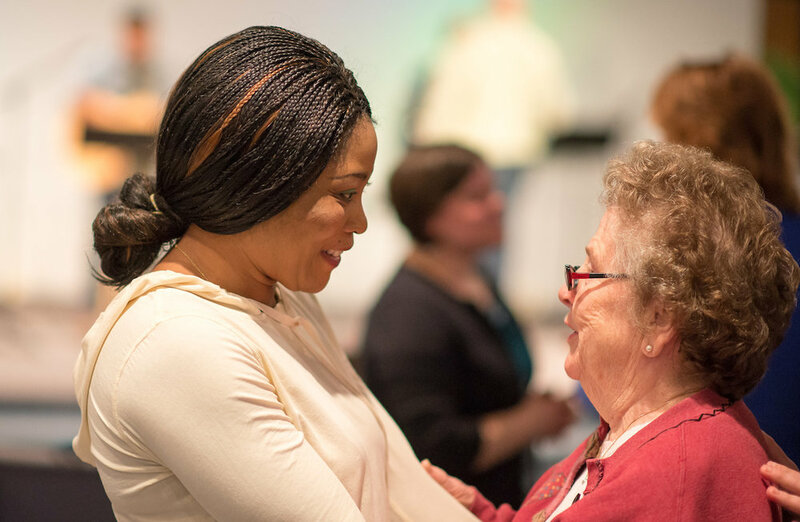 The ElmCreek community family is made up of people from 10 different faith backgrounds, ranging from Pentecostal to Jewish, and we are socially and racially diverse. Together, we invite all to unity in Christ as a church family. When the church gives itself away, we are fulfilling our job as followers of Christ. Here at ElmCreek Community Church, our vision is to work together to share the love of Christ by giving ourselves away. God wants people to love, share, be considerate of others and provide a blessing to the world they live in. Together, we believe we can make a difference in the world around us. We have a dream that somehow, through the work of Spirit of God, we can change what we, as humans, messed up. We can start down the path of being new creations where other people matter, where the hungry are fed, where the orphans are cared for, where people are connected to each other, where the will of God is being done on earth as it is in heaven. In spite of the fact that many believe this is an unachievable dream, we at ElmCreek are learning how to be disciples of Jesus. We are learning on a day-by-day basis what it means to love God and to love our neighbors as ourselves. We are learning to love and forgive our enemies. We are experiencing, in some small degree, the liberating power of doing unto others what we would want others to do to us. We are learning to see how Jesus sees, and in doing so our hope is to bring God’s will from heaven to Earth. When it comes to growing in your faith and connecting with others, we know Sunday morning is not enough. We all need to spend time investing in our faith and relationships which is why we provide ministries your entire family will love. Our ministry for children provides a safe place for kids to learn about God while building great friendships for ages 0-6th grade. Our teen years are the most formative when it comes to building faith and finding friends. Our One80 ministry provides a fun environment for your teens to explore their faith. Here at Elm Creek Community Church, we desire to give God the glory, honor and praise He deserves. Our worship ministry exists to lead God's people into a deeper relationship with Jesus and to encourage worship in every part of our lives. Connect monthly with other women at Elm Creek Community Church. Our monthly events are designed to help you grow in faith and build community. Our men's ministry seeks to help men grow closer to Jesus, growing closer to one another, and help meet our community's physical needs. Our dream is to share the love of Jesus with our neighbors and community by giving ourselves away. Our outreach includes partnerships with Feed My Starving Children and other missions organizations.